Joey Brews | An online brew log for my homebrew adventure. An online brew log for my homebrew adventure. Recently, a consultant buddy of mine was assigned to a project in Iowa. I immediately told him to look for Pseudo Sue by Toppling Goliath. He found some and raved so much about it, he muled some back for me to try. I instantly knew what beer I would attempt to brew next. *Note the IBUs are probably not accurate. It’s much less bitter than this but all the late hop additions cause Beersmith to overcalculate the IBUs. It’s probably closer to 45-50. Since it had been 2 years since my last brew, I knew I would be a little rusty. Also, in my attempt to gradually improve my brewing process and brew gear, I added several new facets to my brew day. The last item was the biggest change for me. 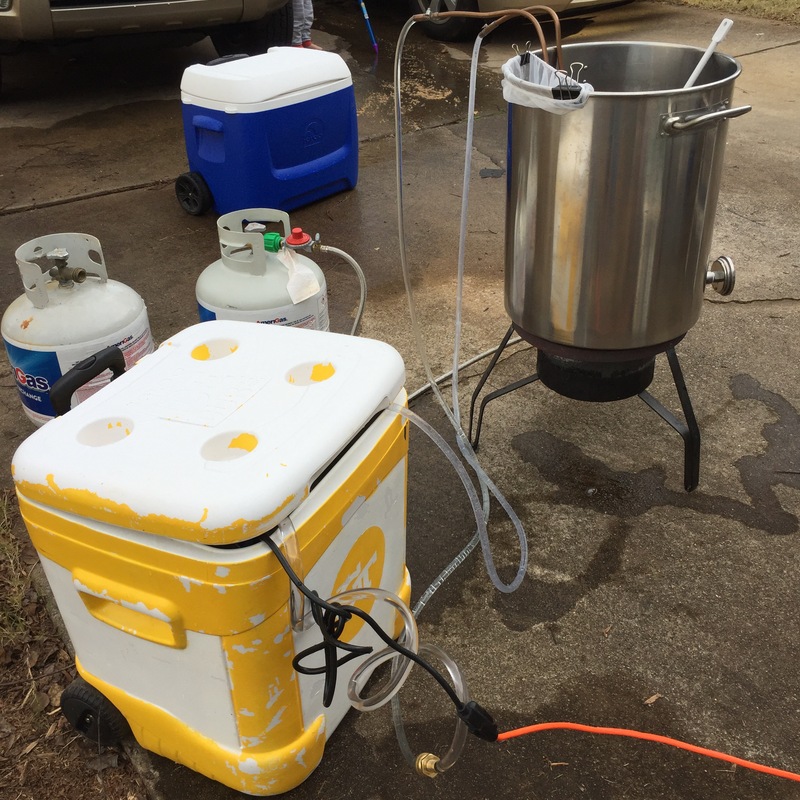 In the past, I used a cooler as my mash tun with a CPVC manifold instead of a false bottom. It worked great but transferring hot wort from the mash tun to the boil kettle was always a pain and inevitably when I would remember 3 days later that I never cleaned out the mash tun, I ended up with a nasty smelling surprise when I’d open the lid. With BIAB, I had an inexpensive muslin/mesh bag from Amazon that I could fit over my boil kettle. I simply mashed the crushed grains in the bag and then lifted the spent grains out like a giant tea bag afterwards. No wort transfers as the wort was sitting in the boil kettle already! Going forward, I bought a reusable BIAB bag (redundant?) from Wilserbrewer a very reputable bag maker in the home brewing network, so I look forward to the next batch where I can use it. As for this beer, brew day went very smoothly, surprisingly. I attempted a whirlpool for some aroma hops which I suppose went OK, although it was more steeping than whirlpooling as I was too busy trying to figure out the counterflow chiller on the fly. Oh well. The beer, although darker than I expected, turned out great. I did fine it with gelatin, so it’s not as hazy as Pseudo Sue, but the grapefruit/citrus/mango/piney flavors and aromas are totally there! Overall, this is one of the best beers I’ve ever brewed which I’m attributing mostly to a good recipe and temperature-controlled fermentation (~64 F). Aside from the beer, I had a lot of fun converting the Pseudo Sue label to Pseudo Joe! I had to watch a ton of youtube videos on GIMP techniques, but in the end, I was pretty proud of the final product. Recently, I’ve had several discussions with friends about coffee and they almost always ask about my home brew setup and technique. Honestly, I don’t claim to be a coffee geek, and until about a year ago, I hadn’t ventured further into the coffee world than White Mochas from Starbucks which Josie claims is not so much coffee as it is a sugar drink. I delved into brewing coffee at home as a means to cut into our Starbucks habit which was becoming an eyesore on the monthly budget. At $4-5 a pop for lattes and mochas between the 2 of us we were probably spending close to $30 a week!! We had a Keurig for awhile, but it took up valuable counter top real estate so we ditched it and I looked for something manual. The Lido 3 was the most expensive item, but when you brew coffee every day, it is worth the investment, IMO. So, after playing with grind sizes and water ratios, I have locked in a setting that works for both my hot (black) coffee and Josie’s cold brew. I love the convenience Of not having to constantly adjust the grinder between each brew. Now, onto the actual brewing of each. Typically, when you make cold brew, you do some sort of overnight brew with a cheese cloth in a tub with grounds or a slow dripping gadget that uses cold water and takes forever. We’ve done both with wildly varying results. Sometimes it turns out well and sometimes it doesn’t (cold dripper clogs up, e.g.). Either way was a lot of work and with the cheese cloth a lot of messy cleaning afterwards. The idea behind Japanese Style Iced Coffee–as I understand it–is that you brew the coffee with off-the-boil water like a traditional pour over. However, the extracted brew drips over ice which immediately chills the coffee. The advantage here is that hot water is much better at extraction than the cold water used in most cold brew techniques. To compensate for the ice which melts and becomes part of the cold brew you have to reduce the boiled water used in the pour over so that the ending water-to-coffee ratio is correct. Pre-wet the filter. I use a Tervis instead of the mason jar used for brewing because I don’t want the hot water to heat up the jar (this is different than hot brew). Add the grounds to the filter and jiggle to flatten the bed. Place the V60 on your brewing vessel of choice and set on a kitchen scale, tared to 0. 0.00 – Start timer as you begin pouring over the grounds. Pour ~120g and immediately stir to ensure that all grounds are wet. Let it bloom until 45 secs. 0:45 – Pour another 100-150g of water around all grounds. ~1:20 – Pour 100-150g of water around all grounds. ~1:45 – Pour remainder of water to reach a total of 500g. As the water level drops, tap the V60 several times on the brewing vessel to squeeze the last bit of coffee drops out. Toss the grounds and remove any noticeable pieces of ice. I usually have one little sphere floating. Serve or store the coffee; this makes two drinks for Josie. Pre-wet filter as above but do it over the brewing vessel of your choice. I either use a coffee mug or a stainless steel tumbler. Add the grounds and jiggle to flatten the bed. 0:00 – Add 80g of water and let bloom. I don’t stir anymore because I don’t find that there are dry grounds due to the smaller amount of coffee. 0:35-0:45 – Start pouring remaining water (up to 370g total). This pour should be very slow and steady. I aim to finish pouring around the 1:20-1:30 mark. 1:45 – As the water level drops, some grounds are left high and dry on the filter. Gently swirl the dripper so the water sloshes up and washes down these grounds. 2:15-2:30 – All coffee has dripped down and the grounds are relatively level and wet but not “muddy”. My wife and I have been captivated by the Making A Murder series on Netflix which inspired my beer’s name and label. I’ve been in an IPA rut (not that there’s anything wrong with that) so I decided to try a new beer style. 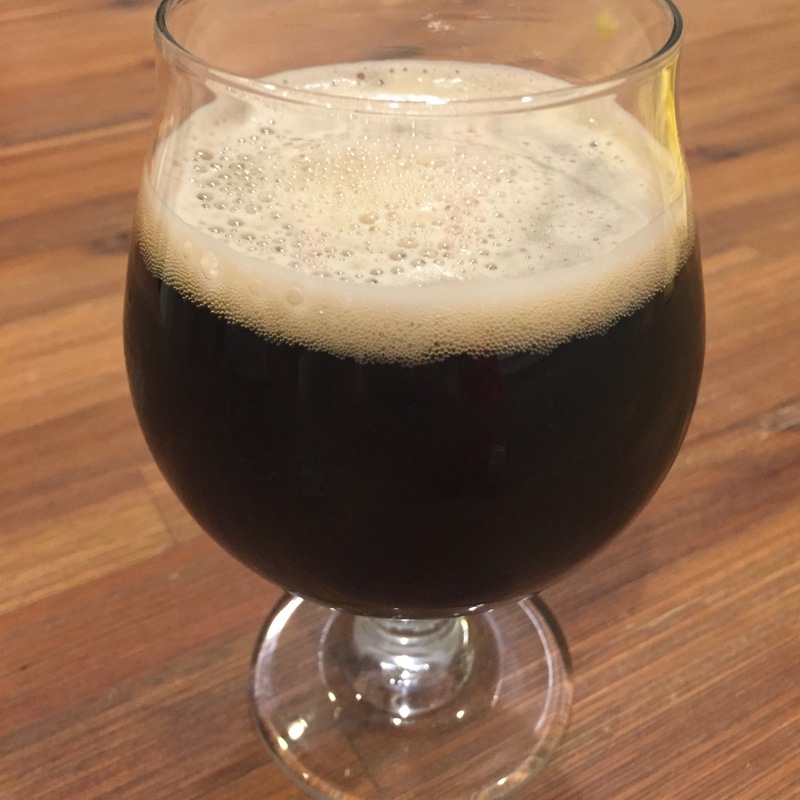 Since winter is right around the corner, I wanted something darker and settled on a Moose Drool clone recipe. I found a recipe on HBT and tweaked it a little. As usual, I try to introduce something new in every batch I brew. Sometimes it’s technique, sometimes it’s equipment. Prior to this brew, I purchased an inexpensive pond pump from Amazon. I use an immersion chiller to get my hot wort down to pitching temperatures, but my ground water is approximately 76 F. While the initial cooling stage moves quickly (going from boiling to 100 F), it takes a long time to get down to pitching temp from there, usually requiring refrigeration to get it down to the 60-66 F range. I found an old tailgating cooler (pictured above) and filled it with ice and water to act as a pre-chiller. I cooled the wort as usual, by hooking up my garden hose to the immersion chiller. Once the temperature had dropped to around 95 F, I shut off the water and hooked up the submersible pump and the ice-bath pre-chiller to the immersion coil. This worked much quicker than ground water alone. This beer has a slight earthiness to it, perhaps from the English yeast, with a faint chocolate-ness and a little roastiness reminiscent of coffee. Some caramel notes round out the “brown” flavor. I think the flaked oats really smooths out the mouthfeel, though, next time I’d like it to be a little fuller. I’d call this medium bodied. *edit – After trying one that had been cold-conditioning for a week, I can say it tastes amazing! Much like the flavors in chili meld over time, this beer has really gone from a collection of tastes and notes, to a harmonic symphony where everything plays well together. Even the yeast has imparted an almost Belgian-like spice character which helps round out the flavors. It’s seriously hard not to chug this addictive beer. It’s very session-able. 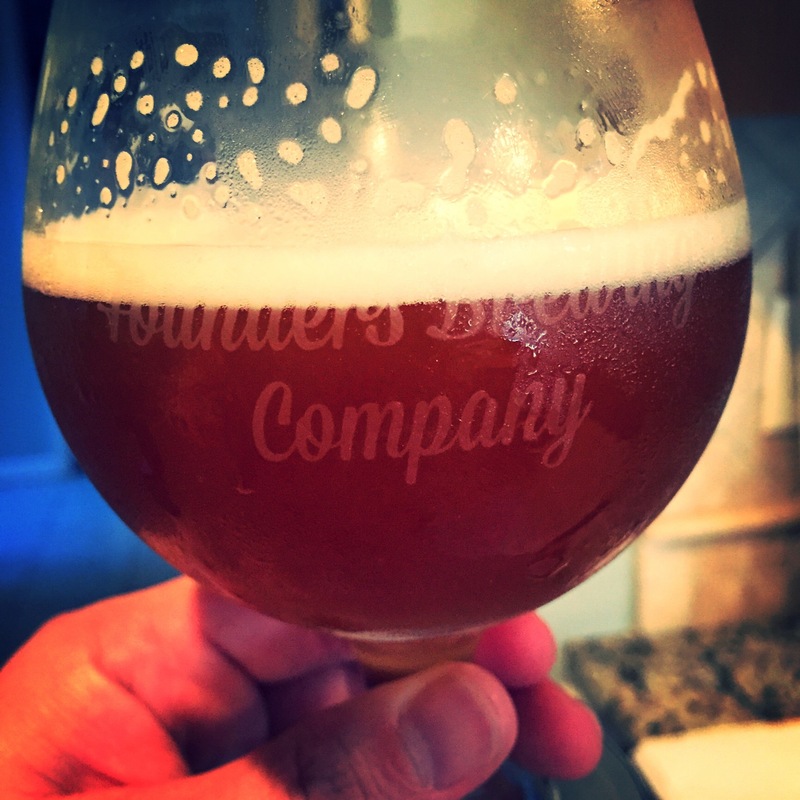 **edit 2 (3/16/16) – So, I entered this beer in the 23rd Annual Peach State Brew Off looking to get some feedback. 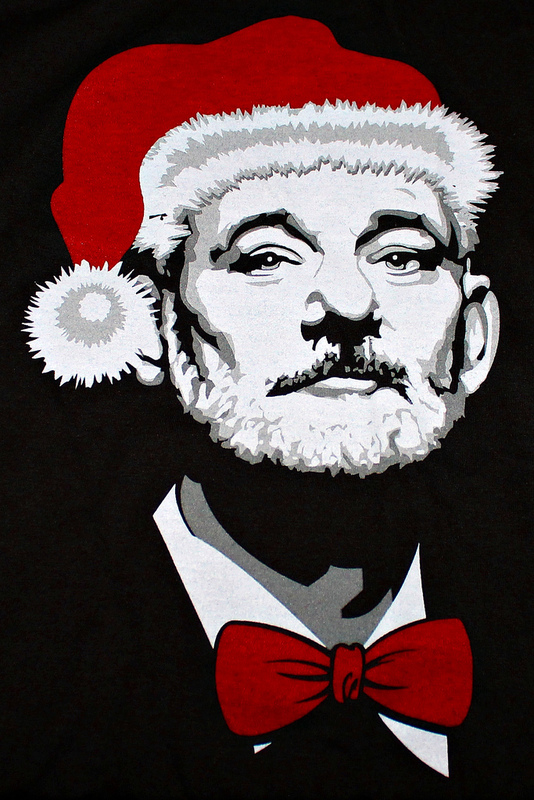 A year ago (Fall 2014), I submitted my extract version of Murray Christmas to a competition in Colorado. It was the second beer I’d ever made and I thought it was amazing. Upon receiving my score (24) and the accompanying score sheets, though, I realized that my palate was very naive [glass shattering] (which is not always a bad thing) and after reading the critiques while drinking my beer, it became apparent that there were some flaws that came through in my brewing technique that the judges were able to perceive. It was a little crushing, but, at the same time, you enter competitions for constructive feedback. Fast forward to this competition; I hadn’t entered anything since, but I felt I had really honed my skills over the past year and this beer–at least to me–seemed to embody that improvement. Moose Drool is also a commercial example of American Brown Ale (19C) in the 2015 BJCP Guidelines, so I felt sure that this clone would definitely be “to style”. As it turned out, my beer advanced to a mini-BOS round (being combined with American Ambers and California Commons) where it finished 2nd for category 19 (still waiting on the silver medal to be mailed) with a score of 37.5! From a brewing perspective, that was quite an improvement from my last entry a year ago. Needless to say, I was ecstatic by the results. I have been doing 5 gallon batches since I started home brewing in the fall of 2014, but after upgrading to a 15 gallon Spike kettle, I was ready to attempt a 10 gallon batch. Since I don’t have a large fermenter, I was going to need two fermentation buckets. As usual, I wanted to make a beer that I couldn’t easily get my hands on. Fortunately (or unfortunately), a lot of big-time breweries in America do not distribute in Georgia, so I had a lot of amazing beers to choose from. I settled on Three Floyds’ Zombie Dust, finding a great clone recipe from Bertusbrewery. I took a cue from Scott’s post and used the two fermentation buckets to utilize different yeasts and different dry hops, essentially creating two beers from one brew session. My first time doing a 10 gallon batch in a 15 gallon brew kettle. I have never actually tasted Zombie Dust (precisely why I wanted to brew this), but from reading about it online, it seems to be a pretty hop-forward, citra IPA; even if 3F calls it an APA. Fortunately, I had some neighbors over to assist with the brew day (hence the name of batch #2; Cul de Sac Brew) because I could not have lifted the kettle with 10+ gallons of hot wort without them (I don’t have pumps so I rely on gravity to transfer from each vessel). Both beers turned out great. Amazing citrus-y flavor from the hops and on overall fantastic IPA; I’ve seen several bloggers and posters claim this is their new house IPA. However, when compared side-by-side, everyone tended to prefer the Cul de Sac Brew over Zombie Dustin [totally unscientific testing; completely anecdotal] which I attribute to the dry hop which Amarillo and more Simcoe. I think the Citra on top of Citra from Zombie Dustin just didn’t ‘pop’ as much. Cul de Sac Brew also tasted ‘smoother’. It did spend more time primary as batch #2 since I bottled it 2 weeks after batch #1, so that could’ve been a factor as well. Either way, they’re both great. 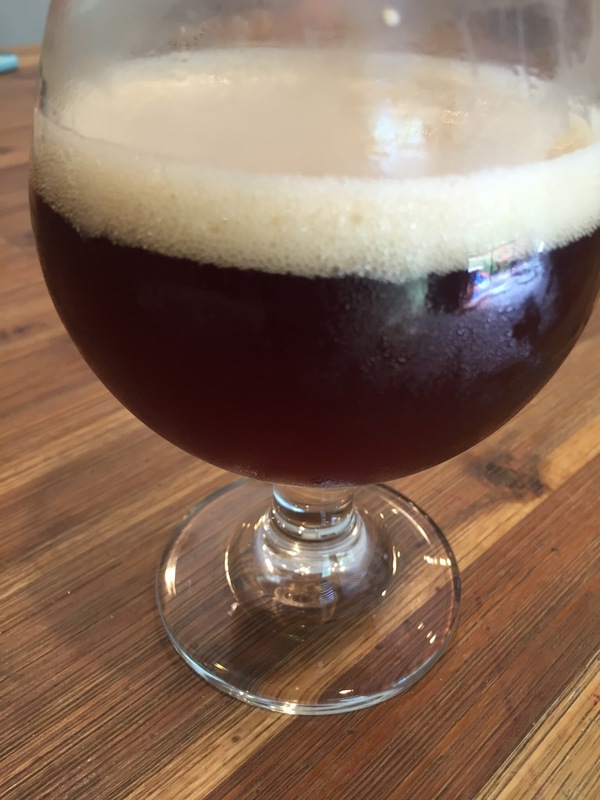 I brewed an extract version of this Christmas Belgian Dark Strong last year which was a big hit with all who tried it. It was such a fun beer to brew and drink, that I thought it would become a seasonal brew for me. Now that I’ve moved to brewing all grain batches, I was hoping to make it even better this year. My goal was to brew this in August or September so the flavors would have enough time to meld together before December. Alas, life got in the way and it got pushed back to October November. Oh well, if all goes well it’ll be pretty good around mid-December, even though it’ll probably peak early in 2016. So on the first Sunday in November, I set out to brew this recipe for the 2nd time (first time I rebrewed anything) using the all grain method. Unfortunately, I didn’t adjust my BeerSmith2 profile for my equipment and didn’t use enough water in my mash, so my 6 gallon batch turned into about a 4.5 gallon batch. While it’s not fun to miss the mark, it’s all part of the learning process, and all the mistakes I make help reshape and hone my skills for future batches (see blow off pic below). FYI, always use a blow off tube. This was 2 days after pitching and a violent fermentation. Fortunately, I caught it early and was able to avoid a messy clean up as everything stayed on the lid. Now, I have recently been making yeast starters and have noticed the beers start showing signs of fermentation within hours of pitching. Starting with a sufficient amount of yeast in good health can only improve the beer as they won’t be stressed out. Here’s a handy calculator from Brewer’s Friend that I use to determine how big a starter to make and how many yeast cells I need. Typically, I shoot for around 300 billion cells for most 5-6 gallon batches. My starter this time only yielded about 200 billion cells, so I pitched an extra vial of yeast (100 billion cells) to be safe. Because my batch turned out smaller than normal (4.5 gallons) and I was using a 6.5 gallon bucket, I was fooled into thinking I had plenty of head space and didn’t need to utilize a blow off tube. A simple three piece airlock should be sufficient, right? Wrong! Whether it was the health of the yeast, the extra 100 billion cells, the warmer temperature (68-70F or so), or a combination of all factors, the fermentation took off vigorously and I came home from work after day 2 and found the krausen had blown through the airlock and spilled out onto the lid of the bucket. Fortunately, that was the extent of the mess because I’ve read of other blow outs that left gunk on ceilings, floors, walls, surrounding furniture, etc. Believe me, that stuff is sticky and difficult to clean up. I cleaned the lid and the airlock, and then fashioned a blow-off tube to avoid any future problems, although, most of the fermentation had already taken place. After cleaning up the mess from the blow out, I setup a blow off tube using the base of the three-piece airlock, 1/2″ tubing and container of sanitized solution. 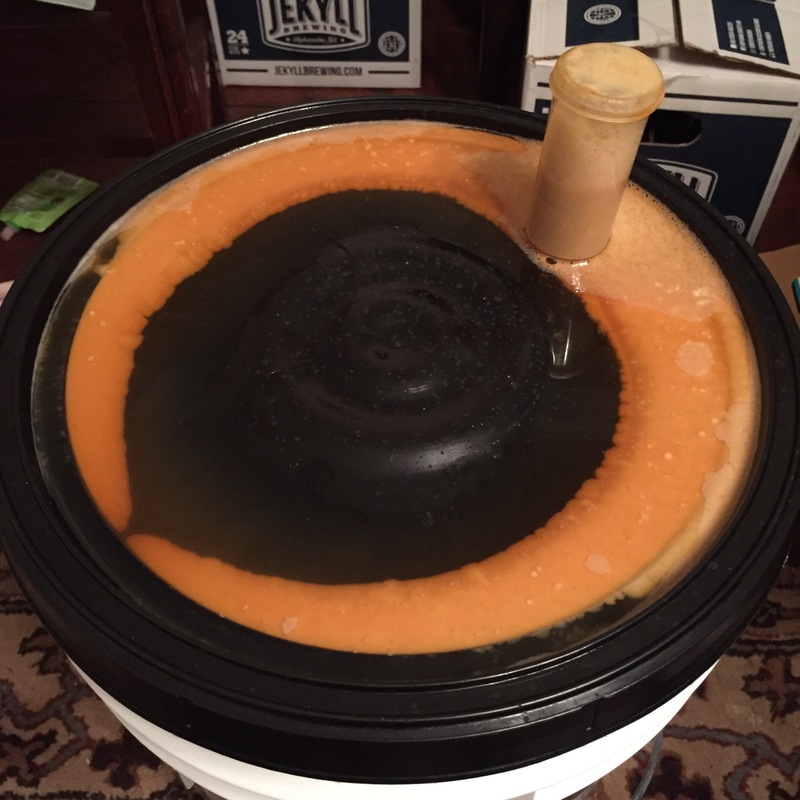 edit: 12/22/15 – Not carbonated yet. This one may take awhile as it’s high gravity and was cold-crashed plus fined with gelatin. 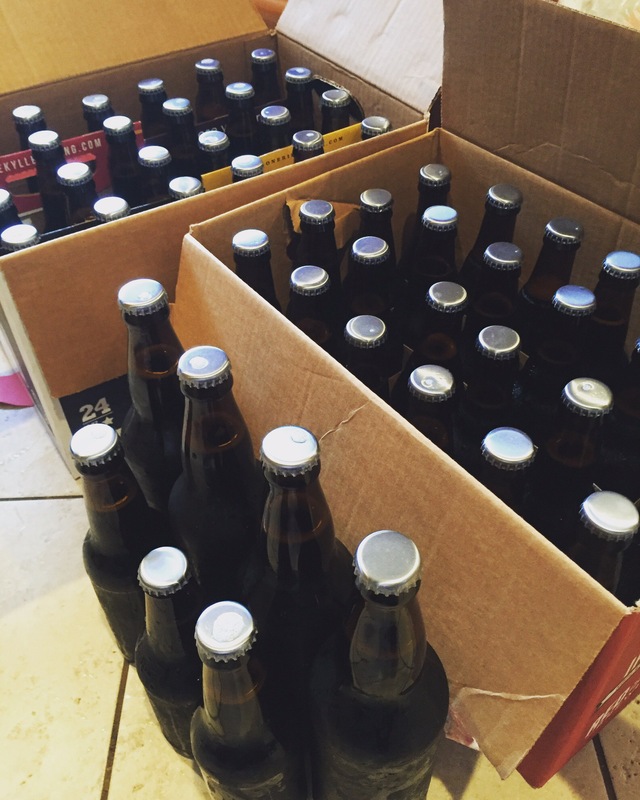 edit: 12/29/15 – Still not carbonated. Also, I noticed some “floaties” in the bottles, but after chilling my test beer for 24 hours, the “floaties” settled to the bottom and I had a crystal clear pour…no carbonation, but no “floaties” either. I’ll probably wait another month before checking again. edit: this took about 7 weeks to carbonate. The final product is a very nice Belgian that finishes on the sweet side with hints of the coriander and orange peel. Last August, I finally got into home brewing after 3 years of picking up and putting down John Palmer’s How to Brew. My friend, Shaun, purchased a brewing kit and urged me to do the same time. So, I bought a kit from my local home brew shop and followed the directions on my first kit–a IIPA from Brewer’s Best. As informative as Palmer’s book is, sometimes you really need to just jump in with both feet and learn by experience. After brewing my first beer, I finally understood a lot more of the book that I had previously read numerous times. With multiple brew days under my belt, now, I feel a lot more comfortable with the terminology, calculations, procedures, equipment, expectations, and overall knowledge associated with home brewing your own beer. But the more that I learn, the more I realize I don’t know. It’s an ever-learning process.